Avazu is a technology-driven company dedicated to worldwide distribution of PC and mobile internet advertising and to performance marketing through programmatic advertising technologies. It was incorporated in Brunei in 2009, and established its headquarters in Shanghai in the same year. Unremitting efforts over the years have enabled the company to set up offices in Beijing, Shanghai, Xi’an, Amsterdam, Berlin, and Hong Kong, with additional branches being planned for New York, Seoul, and London to further solidify its global market position. Its three major Advertising Platforms are Avazu APX, Avazu aNative and Avazu DSP. With the completion of a $350 million Series B funding round by DotC United Group in July this year, Avazu also officially became a wholly-owned subsidiary of DotC United Group. DotC United Group works to solve complex issues arising from business globalization by designing and creating Internet platforms. Its main business platforms are the Avazu Advertising Platforms, DotC apps matrix, and Noogenesis data BI platform, with the former two being run on Amazon Web Services. As the forerunner of programmatic advertising, Avazu provides advertisers a one-stop performance marketing solution (i.e., result-based payment), and offers developers and publishers a full range of monetization services. Avazu Advertising Platforms process more than 20 billion impressions per day and calculate the value of more than 1 million impressions per second (QPS) with their prediction engines. Their systems face such challenges as high traffic, high concurrency, and geographically dispersed customer base, demanding high levels of system stability, security, and availability. Avazu has more than 1,000 customers in 200 countries. Many of its customers also use AWS. To improve access time and thus the user experience, Avazu uses Amazon Route 53 – a highly available and scalable cloud Domain Name System (DNS) web service. It is a fast, easy-to-use, and cost-effective way to handle DNS queries through a global, low-latency network of DNS servers. With Route 53, domain queries are automatically routed to the nearest DNS server for faster responses and more efficient routing of end user requests to lower-latency AWS Availability Zones. 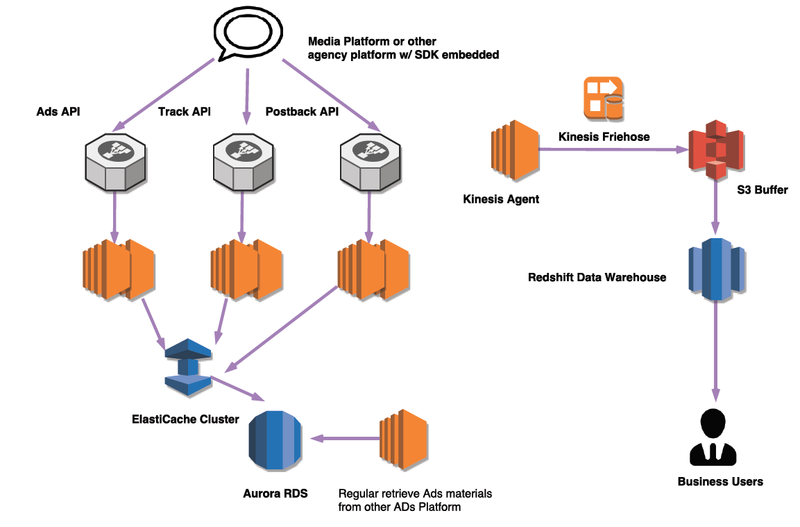 In addition, Avazu’s advertising data are cached in Redis on Amazon ElastiCache and ultimately stored in Amazon Aurora databases to enhance user experience and reduce system latency. Inventories from other advertising platforms are also regularly updated to Aurora databases. Amazon ElastiCache is a web service that enables Avazu to easily deploy, operate and scale in-memory data storage or cache on the cloud. It enables users to retrieve information from the fast and secure managed in-memory data stores without relying on slower, disk-based databases, thereby improving the performance of web applications. Billions of clicks also create massive amounts of real-time data, requiring outstanding processing capabilities from servers. This challenge is readily addressed by Amazon Aurora, which is a MySQL- and PostgreSQL-compatible relational database purpose-built for the cloud that combines the performance and availability of high-end commercial databases with the simplicity and cost-effectiveness of open source databases. Aurora is up to five times faster than standard MySQL databases and three times faster than standard PostgreSQL databases. The Avazu Advertising Platforms are broadly divided into three modules: partnership media access module, click data tracking module, and conversion rate calculation module. The partnership media access module provides media platforms with the Ads API. After advertising auctions, the server pushes advertising content to the media platforms via this interface. The click data tracking module is responsible for recording and tracking user clicks on partnership media’s platforms. Lastly, the conversion rate calculation module provides advertisers with a Postback API to facilitate statistical analysis on advertising performance. All of Avazu’s business is international, and the company is integrated with dozens of premier advertising exchanges – including Google, Facebook, and Baidu – to cover 85% of the world’s internet users. This means that the company must be able to handle high volume of traffic and concurrent access, which would test system stability to the limit. This is why Avazu have chosen Amazon Elastic Compute Cloud (Amazon EC2) cluster for all three of its advertising platform modules, and uses Auto Scaling to automatically increase the number of Amazon EC2 instances during peak traffic to maintain performance, and to automatically reduce server capacity during times of lower traffic to reduce costs. This dynamic scaling ensures the stability of their advertising platforms. Billions of user clicks on ads on partner platforms generate a large amount of real-time data. Because these data have high commercial value to advertisers, they need to be analyzed quickly, efficiently, and accurately. Avazu uses Amazon Kinesis and Amazon Kinesis Firehose to cache data in Amazon Simple Storage Service (Amazon S3) before importing them into Amazon Redshift data warehouses. With this setup, Avazu customers (i.e., advertisers/media companies) can analyze all their data using only standard SQL and existing BI tools, making the process highly cost-effective. Furthermore, with Amazon Redshift, Avazu can examine various traffic performance data to identify fraudulent traffic and make comparisons, and then predict, optimize, and (in real-time) calculate a reasonable price for each advertising slot. This not only ensures a high rate of successful auctions, but also achieves customer optimization goals to the maximum extent. The wide coverage of AWS Availability Zones is one factor that prompted Avazu to operate its advertising business on the AWS platform. By 20th December 2017, The AWS Cloud operates 49 Availability Zones within 18 geographic Regions around the world, with announced plans for 12 more Availability Zones and four more Regions in Bahrain,Hong Kong SAR, Sweden, and a second AWS GovCloud Region in the US. Figure 1 illustrates the system architecture of Avazu Advertising Platforms. AWS cloud services used include Amazon EC2, Auto Scaling, Amazon CloudWatch, AWS Key Management Service, Amazon Route 53, Amazon Simple Notification Service (Amazon SNS), ElastiCache, Amazon S3, Aurora, Amazon Redshift, and Kinesis Firehose,etc. DotC United Group, the parent company of Avazu, also uses AWS for its apps matrix. For example, DotC apps matrix recently deployed a photo album app, Vera Photo, in the Singapore Region, which uses Amazon Cognito and Amazon Rekognition. 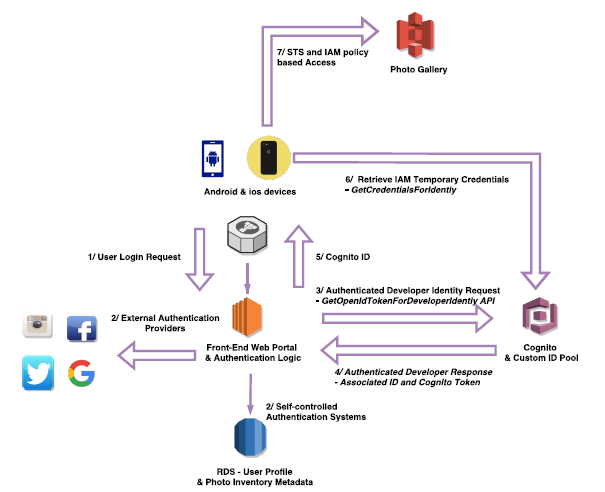 Amazon Cognito gives DotC apps matrix developers the ability to add user registration and login feature to their mobile apps, and to authenticate users with Facebook, Twitter, Amazon or other social media accounts or through the apps’ own login system. In addition, Amazon Cognito allows data to be saved locally to user devices, so that apps can be used even in an offline environment. The service also makes it possible for multiple user devices to synchronize their data. Because of these features, DotC apps matrix can guarantee a smooth user experience no matter what device is being used. Amazon Rekognition adds image analysis function to apps. Specifically, Amazon Rekognition can recognize objects, scenes, and identify celebrities and inappropriate content. It can also recognize, search, and compare faces. With the corresponding API, DotC apps matrix developers can quickly add deep learning-based complex visual search and image analysis functions to their applications. Figure 2 illustrates the system architecture of a photo album app from the DotC apps matrix. AWS cloud services used include CloudWatch, Amazon Cognito, Amazon EC2, ElastiCache, AWS KMS, Amazon SNS, Amazon S3, Rekognition, and Amazon Relational Database Service (Amazon RDS). The main benefits Avazu has gained from AWS are high system stability, low latency, efficient big data analysis, and a smooth user experience. First, before using AWS cloud services, Avazu Advertising Platforms were built on a hybrid cloud model that used rented physical servers in overseas regions. The servers often suffered from system instability, hardware failure, and system delays. After connecting to the AWS platform, Avazu Advertising Platforms became very stable and have encountered zero issues. Second, services such as Amazon EC2 clusters, Auto Scaling, Route 53, and ElastiCache have contributed considerably to the global deployment of advertising platforms and helped lower user access delay to within 200 milliseconds. Low latency, fast response time, as well as fast and efficient big data mining and analysis allow Avazu Advertising Platforms to deliver a superior user experience to customers. Finally, AWS uses decoupling to greatly enhance the speed of developing DotC apps. AWS has so far helped DotC apps matrix develop more than 200 apps which serve more than two billion daily users worldwide. As a premier mobile programmatic advertising platform, Avazu has strict requirements for its one-stop shopping of tens of billions of global impressions. The first of such requirements is precise delivery and multi-dimensional targeting. The second is that target selection under any dimension can be achieved with a single mouse click and automatically optimized. The third is to provide worldwide customers with transparent and accurate traffic and data. And the fourth is to identify fraudulent traffic through a machine-learning engine. To meet these four requirements at the same time, Avazu needs not only a global, stable and efficient service platform, but also real-time calculation and analysis of the historical data of more than 10,000 registered accounts on the platform. A server with outstanding data processing capabilities is crucial for the anti-cheat traffic engine and auction optimization engine to analyze and optimize the large amount of data produced by each auction. AWS fully met these requirements, while also providing personalized configurations whereby Avazu can choose different processor types according to its needs or upgrade hard drive and memory configuration, all while greatly reducing server costs.